Recently heard a good question that needs to be answered; what is the difference between a surgical technologist and a sterile processing technician? This is an excellent question due to the fact that there is some crossover in the kinds of training both of these professions must undergo as well as some similar functions. Outside of a few similarities, there are some major differences between these professions from the type of schooling one would receive to the actual responsibilities the job entails. If you were looking for a new career, you can’t go wrong with either of these professions but it might be better if you knew what the differences really are. In the following article, we will examine the differences between each of these careers and hopefully provide you with an idea on what career path you may want to pursue. 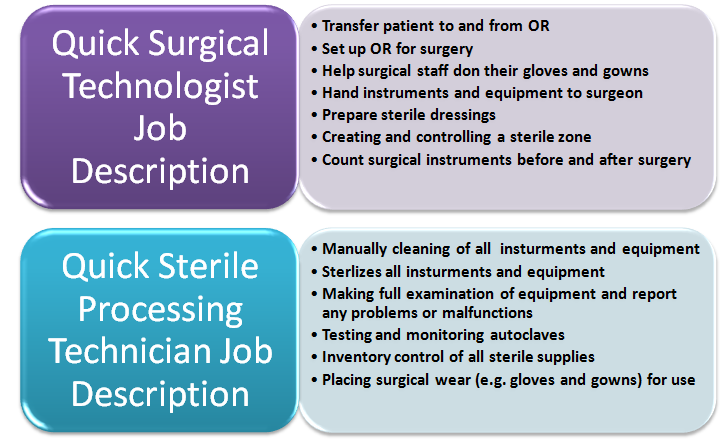 The roles of a surgical technologist and that of a sterile processing technician have a lot to do with keeping the medical instrument and equipment sterile and safe. The similarity between these too professions starts to separate from each other when it comes to work environment and some of the duties. Most of the duties of a surgical technologist are in the operating room helping the surgical team directly by aiding and performing tasks during the procedure. The sterile processing technician, on the other hand, is outside of the OR and mainly deals with the cleaning and sterilization of equipment and medical instruments. Let’s look a little bit closer at their job descriptions. Most of those working in either position has attended a community college, vocational or technical school. The training programs for both of these normally include both classroom learning and a laboratory or externship. Below you will see more specifics on the training programs for each profession. 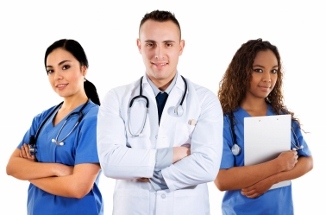 There are over 450 Commission on Accreditation of Allied Health Education Programs (CAAHEP) accredited surgical technology training programs offered throughout the United States, plus a number of online programs to choose from. Students are required to take courses in anatomy, biochemistry, medical terminology and ethics, pharmacology and biology, to name a few. After you have completed your educational requirements, even though it is not mandatory to do so, it is advised that you take the National Board of Surgical Technology and Surgical Assisting certification (NBSTSA) exam to become a certified surgical technologist (CST). 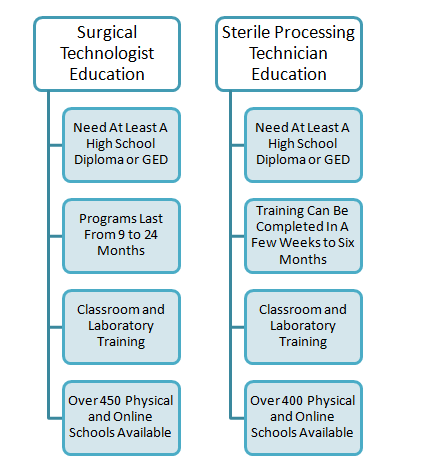 There are over 400 schools that offer training programs to become a sterile processing technician in the United States including a number of online programs. Most students will go through the certificate (non-degree) route in order to start a career path the quickest. Students will learn methods of sterilizing, storing, cleaning and inspecting equipment and instruments before and after surgeries as well as courses in microbiology, medical terminology and disease control. There is a voluntary certification exam that may be taken after completion of the training program. These certifications can come from either the Certification Board for Sterile Processing and Distribution (CBSPD) or the National Board of Surgical Technology and Surgical Assisting (NBSTSA). It is recommended that you complete the certification process in order to open up more employment opportunities as well as potential earning a higher salary. There are some other factors that may help you decide which career path would be right for you. We’ve listed a few of the most obvious factors below in order to help you. In May 2011, the U.S. Bureau of Labor Statistics (BLS) placed the median pay for surgical technologists around $42,000 a year or roughly $20 an hour. The BLS does not have a listing for sterile processing technicians but Indeed.com lists the median salary as $38,000, or roughly $19.00 an hour. As you can see the difference is minor but the reported high end of both professions are significantly different as surgical techs have a higher top end pay than those of a sterile processing tech. The BLS projected outlook for the growth of jobs for surgical technologists is expected to expand by 19% or around 17,000 jobs over the next decade which is faster than the national average. Sterile processing technicians, on the other hand, are only expected to increase by 11% which equates to around 5,000 new employment opportunities. Another important distinction between these two jobs relates to your own personality. If you one that likes to be in the thick of the action then surgical technician would be the way to go, however if you one that shuns the spotlight then you may opt to become a central sterile processing technician. Some people may prefer the challenges of the fast-paced and demanding environment that is the surgical technologist profession while others may like to be more behind the scenes such as a sterile processing tech. No matter which profession piques your interest, you can’t really go wrong. Both offer a good salary, rewarding benefits and knowledge that you are helping others. These positions can greatly evolve over the next decade as the advancement of medical technology continues to jump leaps and bounds ahead. Now you just have to make the decision and we are here to help. The organization s listed on this page are among the leading authorities in the field of surgical technology. We invite you to visit the attached links for more information on surgical tech training, certification and careers. If there is an organization not listed here that you feel should be included, please contact us at admin@www.surgicaltechtraining.org and we’ll promptly add any appropriate links.